Have it sized to fit your space. 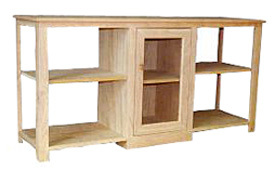 The Modern TV Stand shown is a 60w x 29.75h x 16.5d oak case, with center glass door, & adjustable shelves. Modern TV Stands are available in 36″, 42″, 48″, and 60″ widths in any of our seven woods. Solid wood doors are also an option. Available unfinished or with custom finishing. Go to www.generalfinishes.com to pick a color.